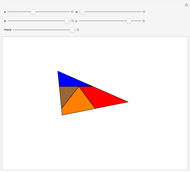 This Demonstration shows Lindgren's triangle-to-triangle dissection. 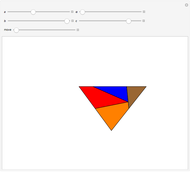 The first to give a dissection of a non-equilateral triangle to a different non-equilateral triangle was Henry Taylor (1905). Lindgren (1953) observed that Taylor's dissection could be constructed using triangular strips. Namely, two copies of a triangle form a parallelogram, and copies of the parallelogram form a parallelogram (P) strip. Two P-strips intersect in a parallelogram and half of it determines triangle dissection. Izidor Hafner "Dissection of One Triangle to Another"